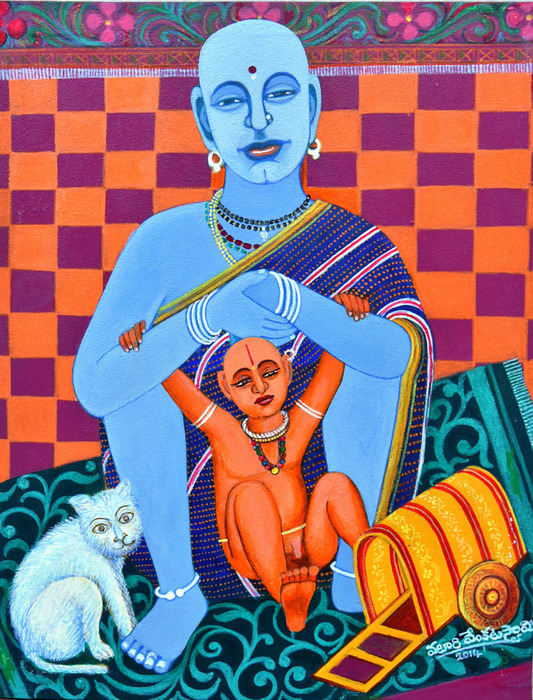 Valluri Venkata Swamy was born in south India and presently lives and works in Hyderabad. 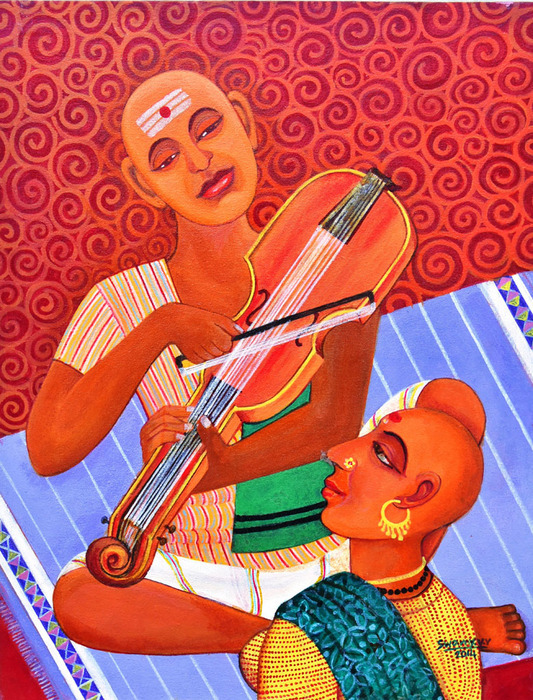 Swamy did over 2,500 paintings in water, oil and acrylic colors in traditional and modern styles on paper and canvas. 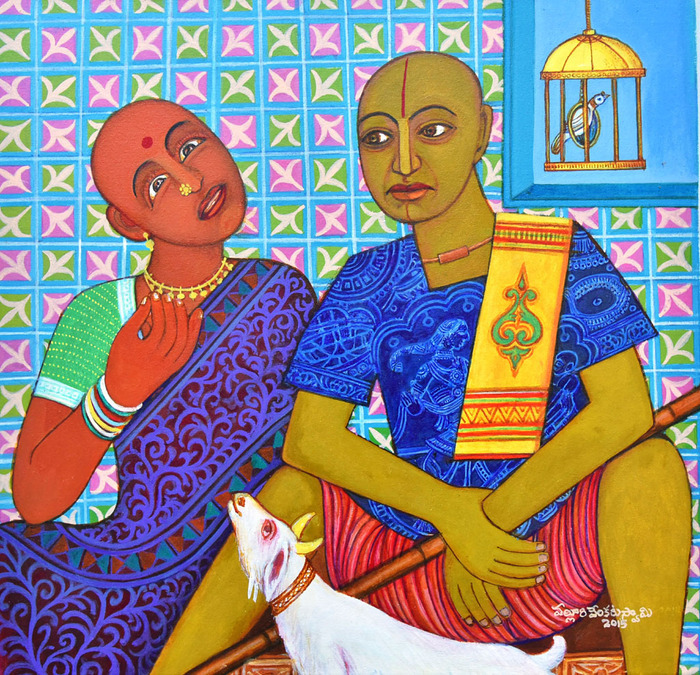 He has held 22 solo exhibitions on the themes of Village, Rocks, Nature & Environment, Electrical Power, Nehru and his Vision, Hyderabad 400 years, Bull fight , 50 Years of Indian Independence and Ganesa besides general themes in various parts of the country and also participated in a number of group shows. His paintings were exhibited at Art Expo New York 2011 ,Artrend, Hong Kong also. His works are in collections of various dignitaries in New Delhi, USA, USSR, West Germany, UK, and those of many other Indian and foreign personalities. 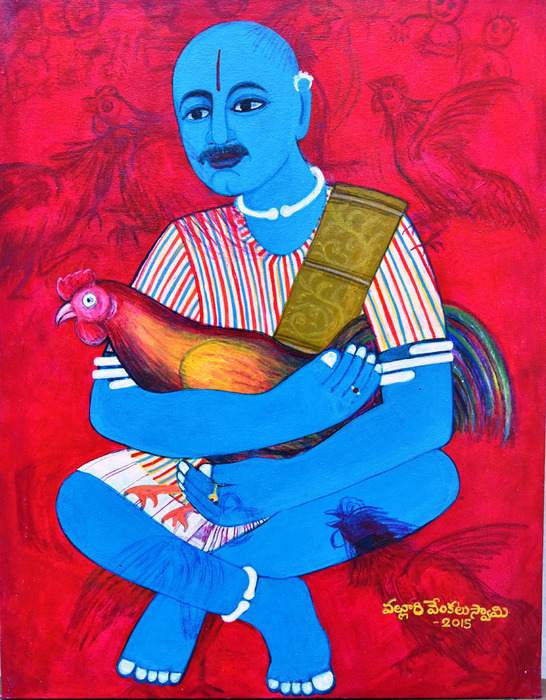 He received a number of awards in the field of Fine Arts and was honored by the Andhra Association and Andhra Educational Society, New Delhi in 1982. He was also honored by Smt. G.T. Tumen Bava, External Affairs Minister of Kirgia, USSR, and His Excellency Rebort Arbuthnott, Minister for Cultural Affairs, British High Commission, British Council Division. For his outstanding contribution in the field of Fine Arts, Shri Swamy was honoured with the\'Ugadi Puraskar 1998 by the Delhi Telugu Academy, which was presented to him by the Vice President of India. Swamy's name was listed in the'Limca Book of Records 1993’ edition. Author of several research papers, articles in literature and Fine Arts, Swamy's books ’For Hyderabad’ and ‘My Inner Vision’ were acclaimed by one and all in the literary circles. Swamy received ‘Honorary Doctorate’ in Literature for his English Poetry Books at the World Congress of Poets held at Sydney, Australia during 2001. ‘Life is not a long vacation, but a consistent living process with affection, peace, sorrows and growth’, as someone said. Every man and woman, has a good opportunity for surrendering to love and they can choose a life of their own. There’s no point of asking why people have reserved certain moods like joys or grief, but people should accept whatever comes on their way should carry on. By risking failures, disappointments and disillusionment in the beginning , they may however, triumph at the end of their life. Sometimes, most things are done out of self- respect and with choice in life. Trust and respect is earned with continuous communication and sometimes they will easily broken too with misunderstanding. After all, we are human beings. Only GOD can judge the things that we do, for what we need to do/to have done. We all experience how hard it is to hold back tears and fake a smile. Jealousy, is one of the most childish and crude feelings in life, that a person should not be exposed to. It's an emotion resulting from the fear that the affection from our partner may, instead, be bestowed upon someone other than one's own self. A man who governs his passions is a master of the world. In the path of your Life, love thy family than anything and everything. 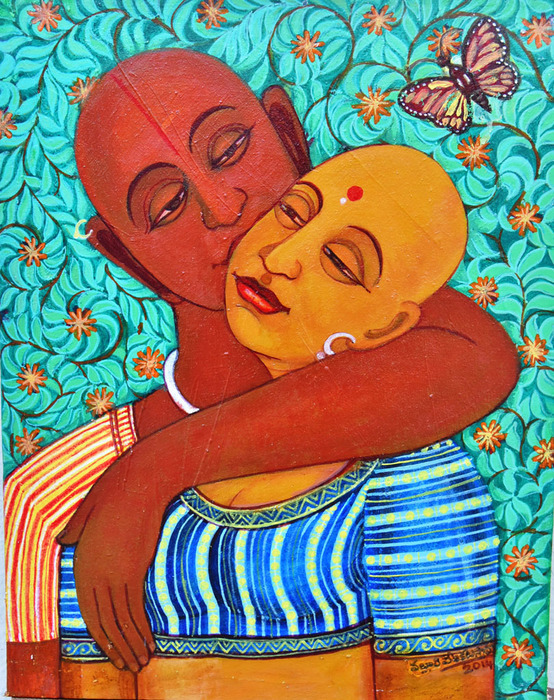 This philosophy of life - feelings, affections, actions, grief and sorrows is the subject matter of Valluri Venkata Swamy, a Senior Artist from Hyderabad, in his series of paintings on ‘LIFE’. The man, the women are the twin characters in his paintings added to flora and fauna, animals and birds besides their relationship. 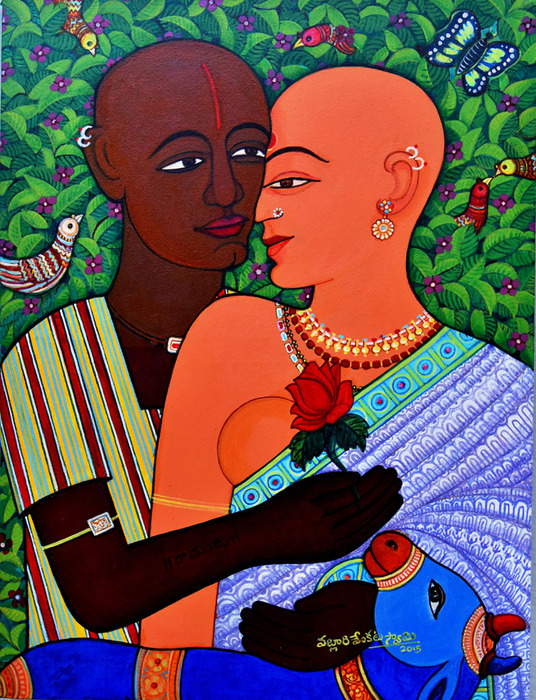 Done in his own stylistic compositions of heads clean shaven, with a primary palette of acrylic colors on canvas, these paintings express various moods.